Although gorillas and other primates (and virtually all mammals, birds, and the majority of phyla) vocalize, they rely heavily on their nonverbal behavior for communication. This short video acts as a reminder of both the ubiquity of body language - and how a lack of this understanding can back-fire. We also see some great examples of human facial expressions here - and can even draw some analog behavior with distracted driving. 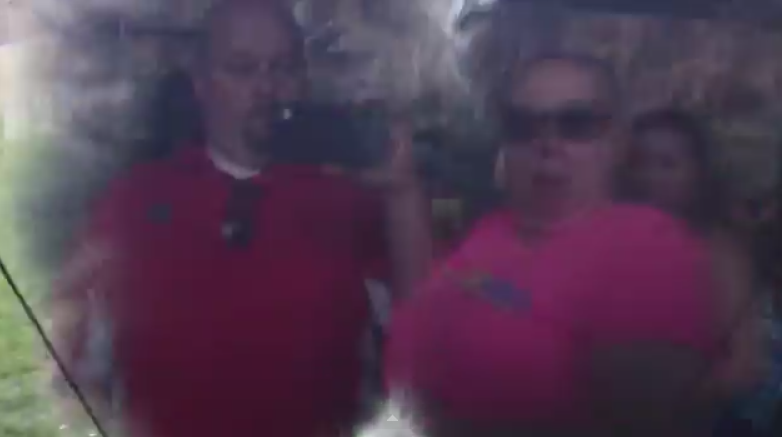 0:05 - In the reflection in the glass we can see a young girl (perhaps five years old) beating her chest. Of course, we cannot blame her - she's mirroring others behavior standing next to her or perhaps she's recalling numerous animated examples. When a gorilla beats on its chest this is a threat display. 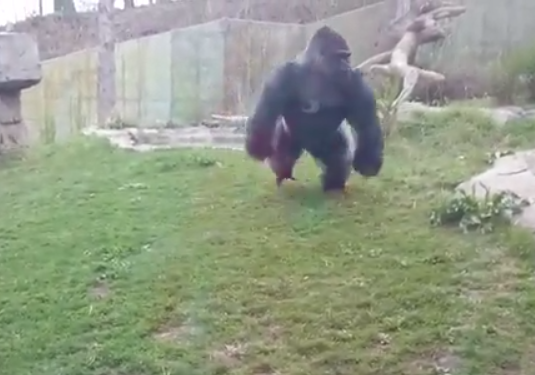 The alpha male gorilla, thinking his authority has been challenged, begins to charge. 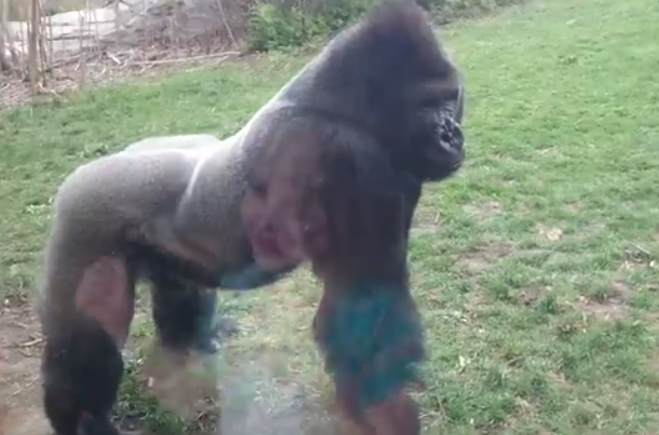 Notice how his head and thus his eyes are turned to side - this non-direct eye contact demonstrates a less than full-fledged attack (e.g., had the glass not been there and these people were instead gorillas, this action was not intended to be lethal - yet an aggressive warning). 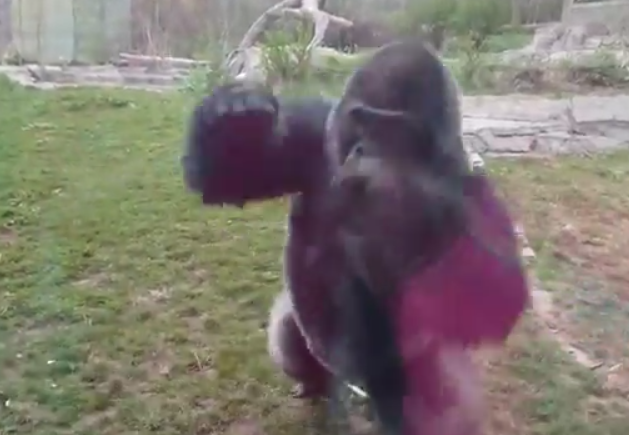 At last split-second, the gorilla turns his head and leaps at the glass with his fists and his full momentum - cracking it. For a few milliseconds, the gorilla's dark body acts as a mirror-backing to enhance the reflective effect of the glass. This enables us to see the videographer (man in red shirt holding his camera-phone) and a woman to his left (our right). Though it is of low resolution, we can see he has a relatively neutral expression on his face. The act of recording an event on camera often acts as an insulating effect - taking the person filming it out of the immediate mental-emotional setting (often at their peril). 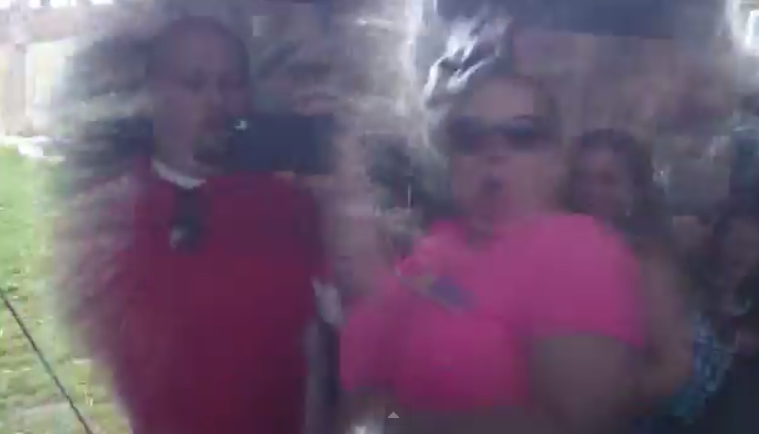 In marked distinction, the woman on the right side of this image (pink shirt) has a moderate "mouth of fear". Why this emotional disparity? Her expression (and his lack of one) is not that he has more courage or she quicker reflexes - she is simply more fully present because she's not recording the event - she's engaged in the present moment. The man in the red shirt is not fully engaged. This same delayed-response and mental-emotional insulation (false-distancing) phenomenon occurs when we are texting or speaking on the phone when driving. Note the crack in the protective glass in the lower left side of this image. Less than a tenth of a second later, the woman's expression turns to a "mouth of surprise". The man's surprise response is beginning - yet it's delayed.